5 Tips for camping in hot weather! Camping on scorching hot days is always a hassle and very uncomfortable for everyone but who doesn’t love traveling all year round! Summer can be fun and enjoyable if you prepare right. Here are 5 tips to make your trip more relaxing and pleasant on those hot 30o days. Pack the right items – Pack wet towels as they are very handy to put around your neck to instantly feel refreshed. Freezing old juice bottles and containers is also a great item to pack and highly recommended as they can be used as ice-blocks and once melted used as water. Carefully choose your clothes – The type of clothes is significant as some materials are thinner and better for hot weather. Packing loose clothing with breathable fabrics will reduce the temperature whilst traveling and make it more enjoyable. Pick the right location – A spot under trees is perfect as it generates shade and reduces camper exposure to the sun. An ideal location is near a water source (lake, river, dam) as it decreases the temperature and creates a breeze. 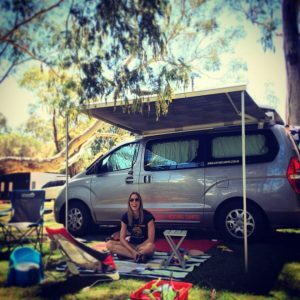 Cover all windows – Keeping the inside of your van unheated can be difficult but simply using the curtains in the camper and putting towels/ reflective film up against windows will enhance shade and cooler air. It stops the sun from shining through and keeps the heat away. 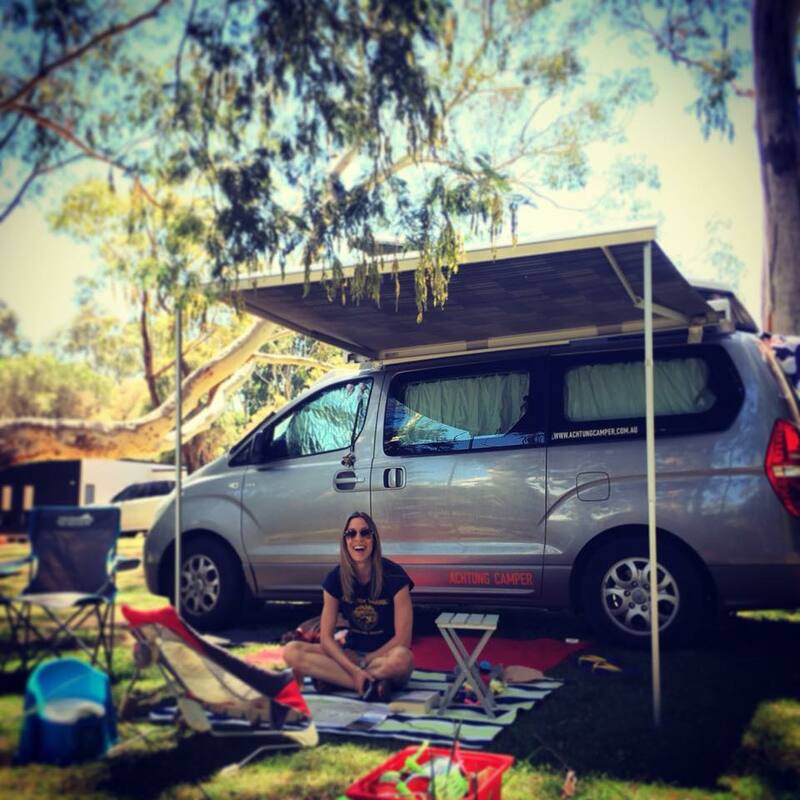 Keep your Camper Cool – Unzip the roof and open the roof windows to allow airflow. Try not to open the doors as it allows some cool air to stay in. Also avoid activities that create extra heat therefore cook everything outside and relax with mates under a tree. That is our 5 tips for traveling in hot weather. Hopefully you find these helpful for your next trip in boiling 30o+ days. If all fails, you can always bring a fan! 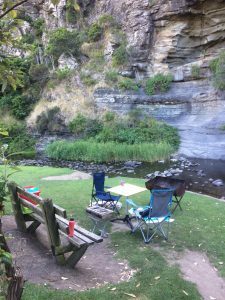 This is undoubtedly one of the most breathtaking spots to camp in Victoria, with shear cliffs framing a river upon which you can camp on it’s bank. The perfect beach is only a minute walk away (although you need to cross the busy Great Ocean Road so take care with children!). There are a number of walks starting from the campground, ranging from 30 minutes return to full day walks. We loved the walk to Jebb’s pool which was close by and a great place for a cool, shady swim. 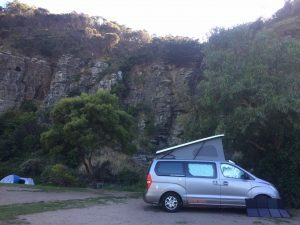 The campground – although the setting is world class, the campground leaves a little to be desired – showers are 20cents for 5 minutes, which we woudn’t mind, however without knowing this before arriving you have to be lucky to have enough 20 cent pieces with you for showers each night. Worse still the reception was also ‘out’ of 20 cent pieces for the 3 days we camped here. A problem as the closest place to change money is Lorne. There is VERY limited power and running water at this campground, which didn’t bother us however it might if you are not ready for a self sufficient stay. All in all, our biggest issue with the campground was the lack of shade/trees and that the camp spots were mostly just dirt and not grass covered – making it hard to keep things clean. Location – Cumberland River is about 10 minutes drive past Lorne, and 2 hours and 10minutes from Melbourne. The distance and amenities make it great for a long weekend. Lighting: a good lamp for continuing your outside activities after dark is essential. Torches: we seem to have an obsession with torches. We have x4 in our campervan; 2 tiny ones easily accessible from the bed for when you need to get up at night but don’t want to wake the other person, a head torch for night time toilet trips and the newest addition: an extremely big, heavy and powerful Maglite which is half for security and half for fun when busting nocturnal animals creeping around our campsite in the dark. 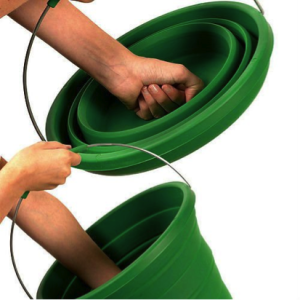 At least 2 buckets (preferably foldable!) for dirty dishes, clean dishes, carrying dishes, washing clothes, using your portable shower etc. The list goes on. Lots and lots of large garbage bags to take your rubbish home with you. Cleaning products for dishes, surface spray, sponges etc. A big citronella mozzie candle. If you can, remember to buy some dry timber before you reach your destination if you plan on having a fire there. You may not be able to buy timber when you get there (or it may be grossly overpriced!). Lots and lots of lighters/packs of matches. A small dustpan (for sweeping dirt and sand out of your caravan or campervan). Tins of food and packets of pasta, rice etc. A bag of marshmallows or preferably 3. Do you have anything to add to this list? Please let us know below!